John, L. and Drescher, M. (2018). Xenopus laevis Oocytes Preparation for in-Cell EPR Spectroscopy. Bio-protocol 8(7): e2798. DOI: 10.21769/BioProtoc.2798. One of the most exciting perspectives for studying bio-macromolecules comes from the emerging field of in-cell spectroscopy, which enables to determine the structure and dynamics of bio-macromolecules in the cell. In-cell electron paramagnetic resonance (EPR) spectroscopy in combination with micro-injection of bio-macromolecules into Xenopus laevis oocytes is ideally suited for this purpose. Xenopus laevis oocytes are a commonly used eukaryotic cell model in different fields of biology, such as cell- and development-biology. For in-cell EPR, the bio-macromolecules of interest are microinjected into the Xenopus laevis oocytes upon site-directed spin labeling. The sample solution is filled into a thin glass capillary by means of Nanoliter Injector and after that microinjected into the dark animal part of the Xenopus laevis oocytes by puncturing the membrane cautiously. Afterwards, three or five microinjected Xenopus laevis oocytes, depending on the kind of the final in-cell EPR experiment, are loaded into a Q-band EPR sample tube followed by optional shock-freezing (for experiment in frozen solution) and measurement (either at cryogenic or physiological temperatures) after the desired incubation time. The incubation time is limited due to cytotoxic effects of the microinjected samples and the stability of the paramagnetic spin label in the reducing cellular environment. Both aspects are quantified by monitoring cell morphology and reduction kinetics. Electron paramagnetic resonance (EPR) spectroscopy is the method of choice for characterization of paramagnetic systems (Atherton, 1993; Gerson et al., 1994; Jeschke and Schweiger, 2001). Diamagnetic bio-macromolecules can be made accessible for EPR spectroscopy by site-directed spin labeling (SDSL), commonly using nitroxides as spin labels (Hubbell and Altenbach, 1994; Feix and Klug, 2002; Likhtenshtein et al., 2008; Berliner and Reuben, 2012). The combination of SDSL with in-cell EPR spectroscopy is a powerful tool to gain information about structure and dynamics of bio-macromolecules such as proteins or nucleotides in their natural environment (Azarkh et al., 2013; Martorana et al., 2014; Qi et al., 2014; Cattani et al., 2017). The most common experimental procedure for the fledging technique of in-cell EPR is based on the microinjection of the target molecules into oocytes from the African frog Xenopus laevis, which are a widely used eukaryotic cell model (Kay, 1991; Barnard et al., 1982; Mishina et al., 1984; Dawid and Sargent, 1988; Richter, 1999). The advantages of Xenopus laevis oocytes for in-cell EPR are the large size of approximately 1 mm in diameter (approximately 1 µl cell volume), the resulting easy handling and the fact that only three or five of them are required for an in-cell EPR sample (Qi et al., 2014; Cattani et al., 2017). Consequently, bio-macromolecules can be introduced relatively easily in the quantity required for EPR measurements into the Xenopus laevis oocyte by microinjection. Hence, there have been numerous intracellular distance measurements of spin labelled DNA and proteins performed by double electron-electron resonance (DEER) measurements after microinjection into Xenopus laevis oocytes (Igarashi et al., 2010; Azarkh et al., 2011; Krstic et al., 2011; Azarkh et al., 2013; Martorana et al., 2014; Wojciechowski et al., 2015; Cattani et al., 2017). The desired thin top of the glass capillary is formed with the Flaming/Brown Micropipette Puller. The program parameters are chosen as follows: Pressure Setting (P) = 500, Heat = 558, Pull = 100, Velocity (VEL) = 120 and Time = 100 msec (agrees with 200 units). The exact position of the Nanoliter Injector can be adjusted with the micromanipulator. At the front of the Nanoliter Injector are a screw clip and a stamp, the position of the latter is controlled by the control computer (see Figure 1). Figure 1. Assembly of the microinjection equipment. 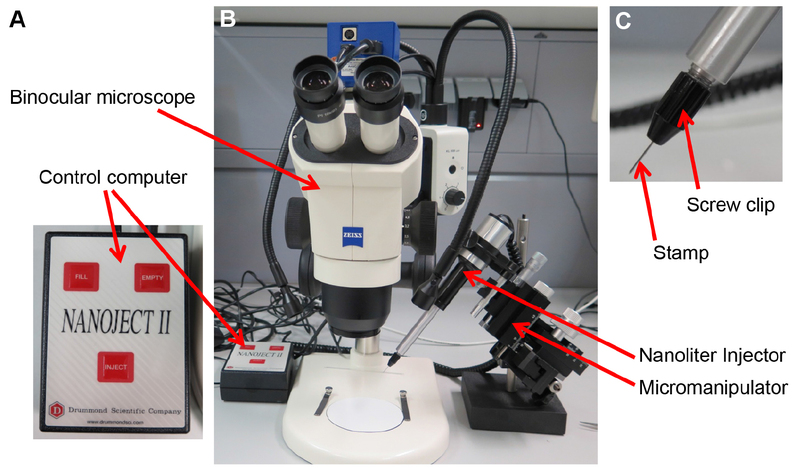 A. Magnified view of the control computer; B. Binocular microscope and microinjection equipment; C. Magnified view of the top of the Nanoliter Injector. To avoid air pockets between the stamp and the injection solution, the sharpened glass capillary is filled up with mineral oil using a single-use syringe. Afterwards, the filled glass capillary is clamped over the stamp into the screw clip of the Nanoliter Injector. Exiting mineral oil is wiped away with a tissue. For the opening of the clamped glass capillary, Parafilm is stretched over the back of a Petri dish (size 60 x 15 mm). A small mark is pressed into the Parafilm at the margin of the Petri dish. The glass capillary is slowly moved towards the mark on the Petri dish with the micromanipulator under observation through the binocular microscope. When the glass capillary starts touching the Parafilm, it is put down horizontally on the Parafilm by simultaneously lowering the capillary with the micromanipulator and moving the Petri dish away from the latter. The laid down, forward piece of the glass capillary (around 2.5 mm) is cut carefully with a razor blade. Subsequently, the mineral oil is pressed out of the opened glass capillary up to around 2 cm with the stamp of the Nanoliter Injector. This run-off can take up to 15 min. 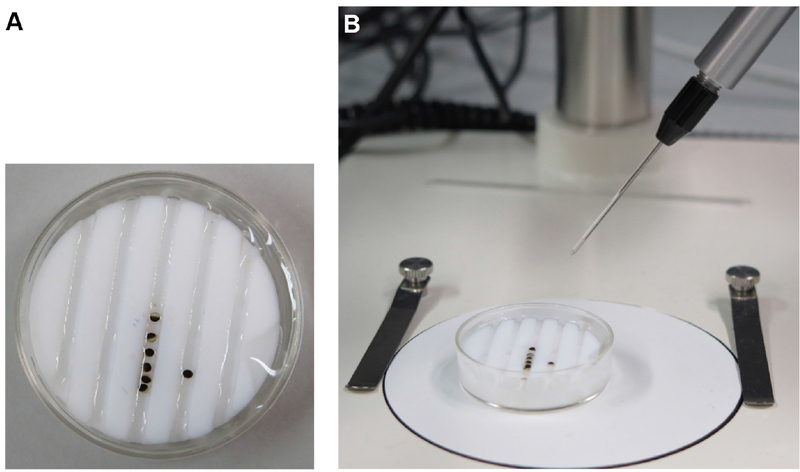 The top of the prepared glass capillary is dipped into a drop of the sample solution (2-4 µl depending on the number of Xenopus laevis oocytes to be microinjected). The sample solution is soaked up into the capillary by using the Nanoliter Injector (see Figure 2 for prepared injector glass capillary). Figure 2. Ready prepared Xenopus laevis oocytes and glass capillary. A. Magnified view of the self-made polytetrafluoroethylene holder with Xenopus laevis oocytes in MBS buffer. B. Prepared injector glass capillary clamped in the Nanoliter Injector with the self-made polytetrafluoroethylene holder. The Xenopus laevis oocytes at stage V/VI in MBS buffer can be ordered from Ecocyte Bioscience and arrive cooled the next day. They are kept in MBS buffer at 18 °C (room temperature is set to 18 °C) and used for the sample preparation not later than the day of delivery. For the microinjection, 6-7 Xenopus laevis oocytes are prepared with a Pasteur capillary pipette on a self-made polytetrafluoroethylene (PTFE) holder (produced by PTFE milling, size 35 x 10 mm, with 1 mm wide and 2 mm high grooves at a distance of 4 mm) in MBS buffer, in which they are shipped, and visually inspected for their state with the binocular microscope (see Figure 2). Xenopus laevis oocytes with initial signs of apoptosis, such as flabby membrane or light discolorations in the dark animal hemisphere of the Xenopus laevis oocyte, are rejected (for comparison of healthy and damaged Xenopus laevis oocytes see Figure 3). Figure 3. Micrographs of Xenopus laevis oocytes. A. Healthy Xenopus laevis oocytes without signs of apoptosis; B. and C. Light discolorations in the dark animal hemisphere of the Xenopus laevis oocytes as an initial sign of apoptosis are tagged by orange circles. C. Progressed apoptosis in the form of flabby membrane and cell deformation is tagged by a red ellipse. Scale bar = 1 mm. The membrane of the Xenopus laevis oocytes is punctured carefully in the dark animal hemisphere, near the parting line, which separates the animal hemisphere from the light vegetal hemisphere of the Xenopus laevis oocyte. The penetrating glass capillary is moved in the direction of the parting line so that the glass capillary points at the parting line from diagonally above. The injection of the sample solution (typically 50 nl) is carried out in this position by the Nanoliter Injector so that the nucleus in the animal hemisphere will not be injected (see Figure 4). Figure 4. Process flow of the microinjection. A. Diagram of a Xenopus laevis oocyte; B. For the microinjection, the glass capillary penetrates the Xenopus laevis oocyte in the animal hemisphere, very close to the vegetal hemisphere, at an approximately 10° angle, tagged by a red arrow. C. Position of the glass capillary (shown in dark blue) during the injection. The glass capillary is removed by carefully pulling it off. Injured Xenopus laevis oocytes are thrown away, while successfully injected Xenopus laevis oocytes are washed carefully with MBS buffer. Upon microinjection, three (for pulsed Q-band EPR measurements at ~34 GHz) or five (for X-band continuous wave [cw] EPR measurements at ~9.5 GHz) Xenopus laevis oocytes are carefully transferred into a Q-band EPR sample tube. For this, a slight negative pressure is built up with a pipette controller on one end of the sample tube, which is moistened with MBS buffer. Initially a small volume of MBS buffer is collected, followed by the Xenopus laevis oocytes and again a small volume of MBS buffer. Care should be taken to ensure that there is no space between the Xenopus laevis oocytes within the sample tube. Furthermore, it must be ensured by visual inspection using the binocular microscope that the cell membrane of the Xenopus laevis oocytes is not damaged through the collection and that no air pockets are in the sample tube. Otherwise, the sample is unusable. This visual inspection must be performed again after the desired incubation time of the Xenopus laevis oocytes at 18 °C. The incubation time has to be selected in accordance with the morphological stability of the Xenopus laevis oocytes upon microinjection and the stability of the paramagnetic spin label in the reducing environment of the Xenopus laevis oocyte. Both are determined prior to the final in-cell EPR experiment (see Data analysis). After the incubation time at 18 °C, the supernatant MBS buffer in the sample tube is removed using a Hamilton syringe in such a way that the MBS buffer just covers the edge of the outer Xenopus laevis oocytes, maximum 1-2 mm distance from the edge of the Xenopus laevis oocytes (finished prepared sample tube see Figure 5). For pulsed Q-band EPR measurements (~34 GHz) the sample is subsequently shock-frozen in liquid nitrogen and stored in the freezer at -80 °C until measuring without thawing. In contrast, for X-band cw-EPR measurements (~9.5 GHz) at 20 °C the sample tube is sealed with the capillary tube sealing compound at the top to guarantee a fixed sample position within the tube. Furthermore, X-band cw-EPR measurements must be performed immediately after sample preparation because the stability of the paramagnetic spin label inside the cell and the morphological stability of the microinjected Xenopus laevis oocytes might be time-limited at 20 °C (see Data analysis). Investigating cytotoxic effects of injected samples: The morphological stability of the Xenopus laevis oocytes has to be checked upon microinjection of the paramagnetic sample solution to ensure that after the chosen incubation time all cells in the sample are still intact. This can be done with a morphological study over several hours, as suggested by Groß et al. (Qi et al., 2014; Wojciechowski et al., 2015). Investigating stability of paramagnetic spin label: The stability of the spin labels in the reducing environment of the Xenopus laevis oocytes is tested by measuring the X-band cw-EPR signal of the labeled macromolecules microinjected into Xenopus laevis oocytes at 18 °C. The decay of the signal intensity corresponds to a reduction of the paramagnetic spin labels under the applied conditions. There are different half-times of the signal decay for different spin labels at 18 °C in Xenopus laevis oocytes (Qi et al., 2014; Karthikeyan et al., 2017). For spin labels featuring sufficient stability, incubation times around 60 min at 18 °C are typically chosen (Qi et al., 2014; Wojciechowski et al., 2015). Using 3-maleimido-PROXYL (3-Maleimido-2,2,5,5-tetramethyl-1-pyrrolidinyloxy) spin labels, typical incubation time at 18 °C is in the range of 15 min (Cattani et al., 2017). Endogenous paramagnetic species: Xenopus laevis oocytes contain endogenous paramagnetic Mn(II) species, which are also represented in EPR spectra (Qi et al., 2014). Thus, untreated Xenopus laevis oocytes are measured for background correction (Qi et al., 2014; Cattani et al., 2017). Spatial expansion of the injected volume by diffusion: In order to determine the effect of translational diffusion of the target molecules within the Xenopus laevis oocyte upon microinjection, the local concentration can be determined by double electron-electron resonance (DEER) measurements (Jeschke et al., 2006; Cattani et al., 2017). Compressible air pockets in the glass capillary would lead to a wrong injection volume and injection velocity. It is important to neither cut too much nor too little of the glass capillary when you open it with the razor blade. If too much is cut off, the diameter of the glass capillary will be too big for microinjection without extensively damaging the Xenopus laevis oocytes. If too little is cut off, the stability of the class capillary will not suffice to penetrate Xenopus laevis oocytes. Ensure that the Xenopus laevis oocytes are always covered with MBS buffer solution. For a quick succession of the microinjections, it is useful to align the Xenopus laevis oocytes in the polytetrafluoroethylene holder in the same way by carefully turning them with the glass capillary clamped in the Nanoliter Injector. 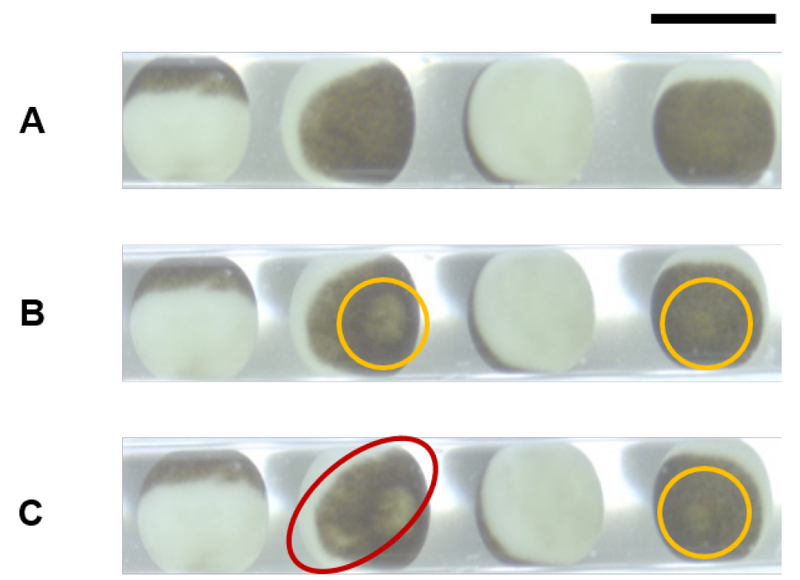 The loading of the Xenopus laevis oocytes into the Q-band sample tube is facilitated by a Parafilm-strip on a Petri dish (size 35 x 10 mm) forming an elevation in the middle of the dish (see Figure 6). The Xenopus laevis oocytes are given with a Pasteur pipette into a drop of MBS buffer onto the Petri dish directly next to the elevation modeled out of Parafilm. By slightly pushing the Xenopus laevis oocyte with the Q-band sample tube against the Parafilm-elevation, the Xenopus laevis oocytes can be brought into a good position for the collection of the Xenopus laevis oocytes into the sample tube without space between each of them. Figure 6. Assembly for an easy collection of the Xenopus laevis oocytes into a Q-band sample tube. A. Xenopus laevis oocytes positioned in a drop of MBS buffer on a Petri dish directly next to an elevation made out of Parafilm can be easily collected in a Q-band sample tube by means of a pipette controller. B. Magnified view of the positioning and collection of the Xenopus laevis oocytes. The protocol described has been developed and improved by different members of the Research Group of Prof. Dr. Malte Drescher and was based on previous protocols of Dr. Andreas Groß (Qi et al., 2014; Wojciechowski et al., 2015) and Dr. Julia Cattani (Cattani et al., 2017). We thank Juliane Stehle and Anna Bieber for the pictures in Figure 6. Support by the Deutsche Forschungsgemeinschaft within the priority programme SPP 1601 is gratefully acknowledged. The authors declare no conflicts of interest or competing interests. Atherton, N. (1993). Principles of electron spin resonance. Ellis Horwood. Azarkh, M., Okle, O., Singh, V., Seemann, I. T., Hartig, J. S., Dietrich, D. R. and Drescher, M. (2011). Long-range distance determination in a DNA model system inside Xenopus laevis oocytes by in-cell spin-label EPR. Chembiochem 12(13): 1992-1995. Azarkh, M., Singh, V., Okle, O., Seemann, I. T., Dietrich, D. R., Hartig, J. S. and Drescher, M. (2013). Site-directed spin-labeling of nucleotides and the use of in-cell EPR to determine long-range distances in a biologically relevant environment. Nat Protoc 8(1): 131-147. Barnard, E. A., Miledi, R. and Sumikawa, K. (1982). Translation of exogenous messenger RNA coding for nicotinic acetylcholine receptors produces functional receptors in Xenopus oocytes. Proc R Soc Lond B Biol Sci 215(1199): 241-246. Berliner, L. J. and Reuben, J. (2012). Spin labeling: theory and applications (Vol. 8). Springer Science & Business Media. Cattani, J., Subramaniam, V. and Drescher, M. (2017). Room-temperature in-cell EPR spectroscopy: alpha-Synuclein disease variants remain intrinsically disordered in the cell. Phys Chem Chem Phys 19(28): 18147-18151. Dawid, I. B. and Sargent, T. D. (1988). Xenopus laevis in developmental and molecular biology. Science 240(4858): 1443-1448. Feix, J. B. and Klug, C. S. (2002). Site-directed spin labeling of membrane proteins and peptide-membrane interactions. In: Berliner, L. J. (Ed.). Biological Magnetic Resonance. Springer pp: 251-281. Gerson, F., Weil, J. A., Bolton, J. R. and Wertz, J. E. (1994). Electron paramagnetic resonance: Elementary theory and applications. Wiley‐interscience, New York. Hubbell, W. L. and Altenbach, C. (1994). Investigation of structure and dynamics in membrane proteins using site-directed spin labeling. Curr Opin Struct Biol 4(4): 566-573. Igarashi, R., Sakai, T., Hara, H., Tenno, T., Tanaka, T., Tochio, H. and Shirakawa, M. (2010). Distance determination in proteins inside Xenopus laevis oocytes by double electron-electron resonance experiments. J Am Chem Soc 132(24): 8228-8229. Jeschke, G., Chechik, V., Ionita, P., Godt, A., Zimmermann, H., Banham, J., Timmel, C. R., Hilger, D. and Jung, H. (2006). DeerAnalysis2006—a comprehensive software package for analyzing pulsed ELDOR data. Appl Magn Reson 30(3): 473-498. Jeschke, G. and Schweiger, A. (2001). Principles of pulse electron paramagnetic resonance. Oxford University Press, Oxford. Karthikeyan, G., Bonucci, A., Casano, G., Gerbaud, G., Abel, S., Thome, V., Kodjabachian, L., Magalon, A., Guigliarelli, B., Belle, V., Ouari, O. and Mileo, E. (2017). A bioresistant nitroxide spin label for in-cell EPR spectroscopy: in vitro and in oocytes protein structural dynamics studies. Angew Chem Int Ed Engl. Kay, B. K. (1991). Xenopus laevis: Practical uses in cell and molecular biology. Injections of oocytes and embryos. Methods Cell Biol 36: 663-669. Krstic, I., Hansel, R., Romainczyk, O., Engels, J. W., Dotsch, V. and Prisner, T. F. (2011). Long-range distance measurements on nucleic acids in cells by pulsed EPR spectroscopy. Angew Chem Int Ed Engl 50(22): 5070-5074. Likhtenshtein, G. I., Yamauchi, J., Nakatsuji, S. I., Smirnov, A. I. and Tamura, R. (2008). Nitroxides: applications in chemistry, biomedicine, and materials science. John Wiley & Sons. Martorana, A., Bellapadrona, G., Feintuch, A., Di Gregorio, E., Aime, S. and Goldfarb, D. (2014). Probing protein conformation in cells by EPR distance measurements using Gd3+ spin labeling. J Am Chem Soc 136(38): 13458-13465. Mishina, M., Kurosaki, T., Tobimatsu, T., Morimoto, Y., Noda, M., Yamamoto, T., Terao, M., Lindstrom, J., Takahashi, T., Kuno, M. et al. (1984). Expression of functional acetylcholine receptor from cloned cDNAs. Nature 307(5952): 604-608. Qi, M., Groß, A., Jeschke, G., Godt, A. and Drescher, M. (2014). Gd(III)-PyMTA label is suitable for in-cell EPR. J Am Chem Soc 136(43): 15366-15378. Richter, J. D. (1999). A comparative methods approach to the study of oocytes and embryos. Oxford University Press. Wojciechowski, F., Groß, A., Holder, I. T., Knorr, L., Drescher, M. and Hartig, J. S. (2015). Pulsed EPR spectroscopy distance measurements of DNA internally labelled with Gd3+-DOTA. Chem Commun (Camb) 51(72): 13850-13853. How to cite: John, L. and Drescher, M. (2018). Xenopus laevis Oocytes Preparation for in-Cell EPR Spectroscopy. Bio-protocol 8(7): e2798. DOI: 10.21769/BioProtoc.2798.